Spray inside of 3- to 4-quart slow cooker with cooking spray. If beef is tied, remove strings or netting. Place beef in cooker. Sprinkle with brown sugar. Pour dressing over beef. Remove beef from cooker; place on cutting board. Shred beef, using 2 forks. Return beef to cooker; add Italian seasoning and mix well. Using slotted spoon to remove beef from cooker, fill each bun with about 1/3 cup beef. Serve with remaining juices. Sprinkle hot sandwiches with your favorite shredded cheese and serve with a tossed salad. 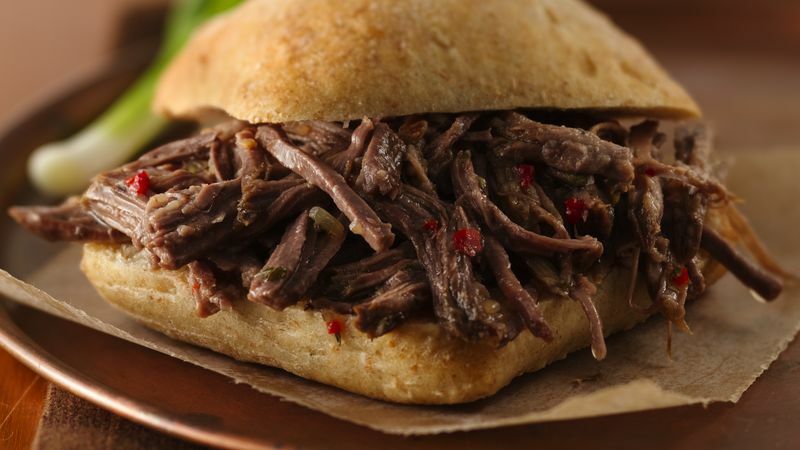 Slice 1 large onion and 1 large red bell pepper, and place on beef in slow cooker. Continue as directed in step 2.